In this edition of Student Profile we speak with Accelerized Golf student John Guzman. For the last several years John has been a model student of Accelerized Golf. He enjoys learning about the golf swing and how to improve the flaws in his swing. CT: Why did you start with Accelerized Golf? JG: I am a scratch golfer, but I wanted to improve my misses. I knew I could lower my scores with better ball striking. Having video technology would allow me to improve at a much quicker rate. CT: What did you find most interesting about your first lesson? JG: My swing did not look how I envisioned it. You have a feel of what you believe your swing looks like but it’s not even close. Having a plan of what I needed to fix in my swing and what order we were taking was important. It kept my thoughts to what was the most important change at the time. 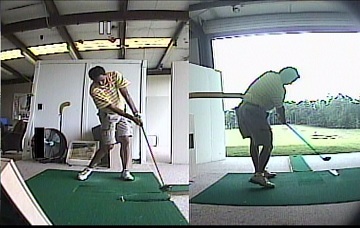 CT: About how many times a month do you take lessons or practice in the building at Fox Creek? JG: Well when I first began with you guys I had a lesson about once a week. But now, I know my own swing flaws and what I need to do to fix it. I still take a lesson once a month to make sure I stay on track. The practice is what I cannot get enough of. I love to practice with the video and the Hotlines technology. I spend about four hours a week in the building practicing. CT: What were the easiest and hardest things to fix in your golf swing? JG: You told me I needed to stay behind the golf ball thru impact; this is why some of my misses were to the right. The thoughts you gave me to stay behind the ball was an easy swing change. The hardest swing change has been staying in my posture thru impact, I always say I’m like a “Pop Tart”, I keep popping up. CT: What is your best round this year? JG: I shot 67 this year with 8 birdies. Had a few mistakes with the putter, but I hit the ball solid and online all day. It was fun to see all of my hard work paying off. CT: What would you say to someone who is thinking about taking lessons with Accelerized Golf? JG: You need to be able to see what you are doing in your swing. Then you have to be able to practice the changes with feedback. The only way you can improve your swing is to have the video system and Hotlines technology to practice correctly. The feedback you get is priceless. Trying to make swing changes on a range without feedback is a complete waste of time. CT: What do you enjoy most about golf? JG: Hitting the ball flush most of the time. Since I have been working with Accelerized Golf, my swing has become very efficient. I can hit the ball with what seems like very little effort and my misses are in front of me and still in play. CT: Who would be in your dream foursome and where would you want to play? JG: Dustin Johnson, J.B. Holmes and Alvaro Quiros. It would be fun to watch these guys bomb away at Augusta National!!!!! Join us next time for when we interview another Accelerized Golf Student.